Over the last fifteen years Caphyon has created user-friendly, reliable and secure software applications for developers and Internet professionals. 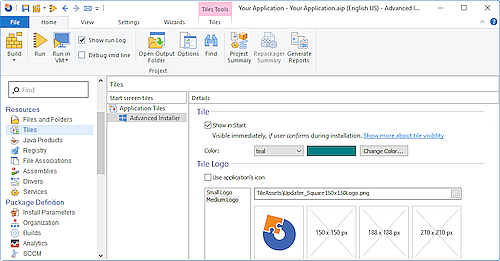 Advanced Installer is the Windows Installer creation software of choice for countless developers worldwide, with capabilities ranging from MSI authoring and repackaging to emerging technology platforms such as Universal Windows Platform (UWP). Designed for performance and ease of use, it ensures a great return of investment for companies, reducing time wasted in creating the setup packages and leaving more time for product development. Advanced Installer simplifies how you package and update your software on Windows. Conquer the complexity and harness the power of Windows Installer through our simple GUI. Create your setup package directly from Visual Studio, using the official extension from Advanced Installer. Import your solution artifacts with just a few clicks. Officially supported extensions for Team Foundation Server, Jenkins, TeamCity and Bamboo. Use our command-line interface to create your custom pipeline. Build merge modules to share your work with the team and document everything you want from the installer using the built-in project notes support from our GUI. The standard XML format designed for Advanced Installer projects give you simple code diffs. Easily spot accidental changes before breaking your build. SHA256 digital signing for all your setup packages and integrity checks on update downloads. We protect your users and your reputation by applying the latest security standards. Deploy seamless application updates using the built-in updater from Advanced Installer. Configurable within minutes, all from our simple and powerful GUI. Create the best UX for your end users. 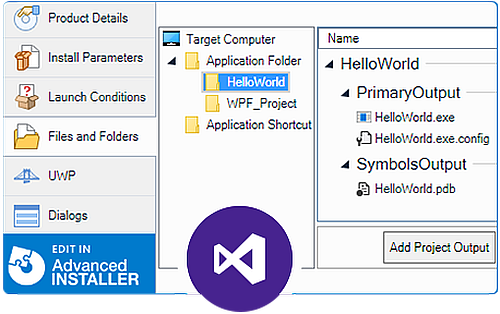 Customize and extend the built-in functionality provided by Advanced Installer with your code, written in C#, C++, PowerShell, VBScript or by using our predefined custom actions. Create a unique and perfect UI for your installers using our WYSIWYG editor. Localize your installers to create the best user experience, no matter what language your users speak. Package and deploy both desktop applications as well as web apps. Publish them to Azure Websites, Microsoft Windows Store or on your own website. 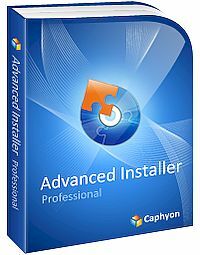 There are four commercial editions of Advanced Installer. Visit our feature comparison matrix to check out the differences. Advanced Installer is licensed per developer. That means you need one license for each developer using the product. Each developer is allowed to install his license on any computer he is using Advanced Installer on. A floating license is available as an option of the Enterprise and Architect licenses. It can be used by any developer on any machine (non-simultaneous use). You need one floating license for each developer using the product concurrently. A License gives you the right to unlimited use of the Advanced Installer product. A Maintenance Plan gives you access to application updates and technical support. Each Advanced Installer license purchase includes a free 6-month Maintenance Plan.